In the Media Browser, you’ll notice a button called Slideshow. You also find a Slideshow option in the Create panel. Both options are used to create slide shows that you can export as a movie file and share with friends and family. The other slide show option you have is to view selected photos as a slide show on your computer. Naturally, you find this option as a menu command in the View menu. However, the command you want is not called slide show. Elements provides you with a Full Screen command where you view your pictures in Full Screen view as a slide show. Select photos in the Organizer and choose View → Full Screen (or press F11). The first photo in Full Screen view opens with a number of tool and panel options. 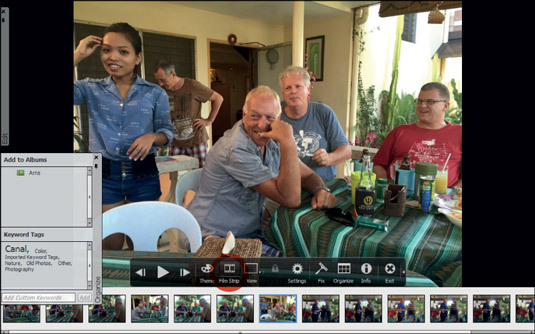 Click Filmstrip to see mini thumbnails of the photos in the slide show.